Octavia Butler, born June 22, 1947, started creating stories in her head at the age of four and by the time she turned 13, was writing stories about new worlds on her mother's Remington typewriter. After college, she earned a spot in the Screenwriters Guild Open Door Program where she captured the attention of Harlan Ellison who encouraged her to do the Clarion Science Fiction Writer's workshop, where she also met Samuel Delaney. Crossover, her first story was published in an anthology of student work. From there, she went on to publish twelve best selling novels as well as numerous short stories. She won several awards and is the first and only science fiction writer to win the MacArthur 'Genius' Fellowship. Butler passed away in February 24, 2006 at the age of 59. With Black female protagonists, radical notions of kinship, and a keen understanding of power dynamics, Butler’s writing revamped the conventions of the science fiction genre. Butler’s bold imagining of the future has come to inform the way we live now. 2016 marks the 10-year anniversary of Butler’s death. She has written three different series over the years: Patternist, Xenogenesis and Parables. SWFA provides a excellent chronological list of how to read her books. I currently have Dawn in my stacks waiting to be read. 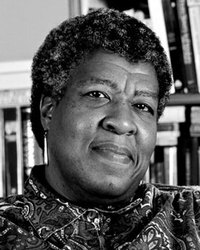 Find out more about Octavia through Portalist's 15 Fascinating Facts about Octavia Butler. Join me in celebrating our author of the month and reading one of her novels this year.